From Goodreads ~ Wanting to get on track and actually getting (and then staying) on track are two totally different things? The million-dollar question is: how do we find the inner motivation to go from thinking about a healthier lifestyle to actually adopting one? How do we get off the sofa and out the front door? "Finding Your Fit: A Compassionate Trainer’s Guide to Making Fitness a Lifelong Habit" provides readers with practical tools that will allow them to connect the dots between wanting to make a health and fitness change, and actually making it. 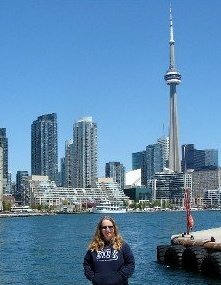 Kathleen Trotter is a personal trainer based in Toronto, Globe and Mail columnist, pilates equipment specialist, Huffington Post blogger and fitness writer. Her services include personal training, personalized programs, group seminars and fitness writing. She came to my attention because I saw she is conducting the Finding Your Fit Library Series at the Toronto Public Libraries from July to November. I've been on track since last July to lose weight, get more active and get healthier so I like reading books about getting and keeping fit. 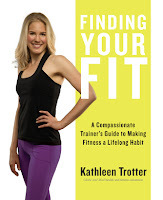 This is a good book for beginners who are thinking about making fitness a lifelong habit (hence the title) or a good reminder for those of us who have been struggling all our lives. It promotes the principle of not striving for perfection and suggests the 80/20 rule ... tell yourself that as long as you are good 80% of the time, you can still enjoy less-healthy options 20% of the time. For me, I find this hard ... it's all or nothing for me. I'm either right on or waaaaaaaaaaaay off. I liked the writing style ... it was conversational and as if the author was talking with me. I liked that the author suggested turning negative thoughts like "I don't want to train" into "I am so lucky that I get to train" and "Exercise is not something you have to do; it is something you GET to do! Moving is a privilege." She shared her personal experiences which made her easy to relate to. There are suggested exercises throughout the book, some with colour pictures. The author encourages you to find exercises you like (she loves running) so you can be assured of sticking to a routine. She gives recommended workouts depending on what kind of an exerciser you are (I like classes but am okay doing stuff on my own). While it talks about eating healthy, you would have to look elsewhere to get more detailed information.